Duane served in the Air Force for 16 years, completing three tours overseas. Stephanie said those tours changed him. 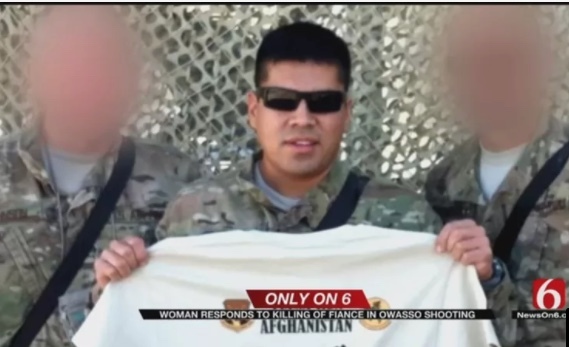 OWASSO, Oklahoma - As the OSBI continues its investigation into a deadly officer-involved shooting in Owasso Wednesday night, the fiancée of the man killed is speaking out. Stephanie Perdew recounted what started out as a normal day and turned into one that changed her life forever. "I think that maybe he went out there crying for help. I don't think he thought it was going to be over," said Perdew. Police were called to Stephanie and Duane Preciado's house Wednesday night. Stephanie said Duane had been drinking and was depressed and called his best friend for help. "His wife called to have a wellness check done. Duane didn't know the cops were coming. Of course, when you have PTSD it can be triggered at all times, when there's a big knock at the door," Perdew said.